Heart Arrhythmias, Mg and Ca in Balance! Vitamin D3 is extremely important in the maintenance of a healthy heart. Also of importance are magnesium and its extreme importance in maintaining the ‘electrical balance’ in the heart. I know of two women that had years of heart arrhythmias and were on medications without success of solving the issue. Both of these women within a day of supplementing with magnesium discovered that the arrhythmia was gone. Two different cardiologists in two different cities were simply applying the knowledge that they had without success. 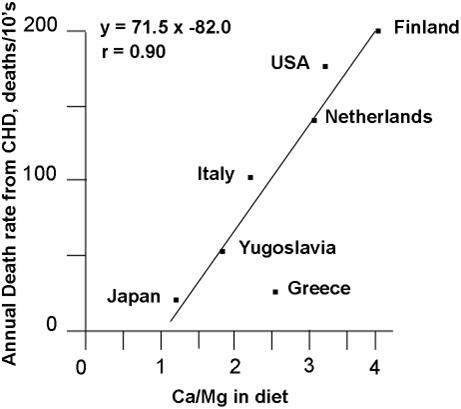 As you can see from the graph, the closer that magnesium and calcium intake are balanced, the lower the rate of death from cardiovascular heart disease. I am not sure why there is such a resistance to following the science in treating heart patients. I suspect that one of the very real issues is that there is no mainstream test to measure cellular magnesium. If you are deplete in magnesium, it can take six months to a year to raise the cellular level to a desired value with regular supplementation. However, to my knowledge there is no test to tell if you are replete at the cellular level. The importance of the cells being filled with their need for magnesium is that magnesium is the mineral of choice of the one thousand to two thousand mitochondrial bodies in each cell. The mitochondrial bodies are your energy engines that take the food you eat and convert it into energy that your body can use. That is the ADP –ATP cycle for those of you with knowledge of biology. More importantly is the balance of magnesium and calcium. The body uses over twenty five percent of the energy produced to keep magnesium and calcium on the correct sides of cellular membranes for health. If you do not have enough magnesium, then the mitochondria cannot provide the energy you need. I suspect that most if not all sudden heart events are triggered by a need of magnesium at the cellular level. This may include sudden infant death syndrome. Since there is not a standard test for cellular magnesium, it most likely will not even be found during autopsy. If you have had a pace maker installed, be sure to ask your cardiologist about magnesium. I have nagged my wife repeatedly, a clinical chemist, to develop this test. I am sure that if it was easy she would have. We typically get enough calcium in our diets. We do not have enough magnesium in our diets. As you can see from the graph, it is obvious that in Japan there is adequate magnesium and thus the lower rate of death from heart disease. Also the need for healthy bones is to have enough magnesium, vitamin D3, and vitamin K2 to direct the calcium to proper function. One cardiologist that has it right is Dr. William Davis that writes the popular Track Your Plaque Blog. You may read an article on magnesium from his blog here: http://www.trackyourplaque.com/blog/2010/02/magnesium-and-arrhythmia.html His inquirer had a similar experience with heart arrhythmias as the people I know. I hope that he writes more soon on how much magnesium is needed. Until modern medicine comes up with a way to test for cellular magnesium, then you are on your own to assure your intake level is high enough. I think Krispin, a nutritionist, has it correct. Read her take on magnesium requirements and why: http://www.krispin.com/magnes.html The really good thing about magnesium is that it takes about three time more than you need to reach bowel tolerance. Magnesium is an excellent laxative. The upper side of intake is 4.5 mg of magnesium per pound of body weight per day. It is difficult for me to believe that Japan has a death rate from heart disease that is 5 times lower than the US and the medical profession acts like it is clueless. Arrhythmias, muscle cramps, and hard stool, you need to act quickly – pandemic survivor. The recent news about how beneficial that vitamin D is to the pancreas reminded me of my friend Gus. Gus is of Greek decent, a retired stone mason, and well, a real character. Gus loves the Lord. Now that he is retired, his hobby is making rounds with a doctor that specializes in pulmonary functions. As the doctor treats the patient medically, Gus prays for their recovery. Now there is a doctor that understands that life is not just a bunch of chemicals contained in an epidermis. Gus has learned what it means to be living ‘fat’ in America. His love of pasta, biscuits, and pancakes has caused him to become slightly overweight and headed directly to type II diabetes. He was telling me about how he was researching which drug he should take to control his blood sugar. He was not happy about all of the side effects. I suggested that he work with his doctor to try to heal his pancreas before diving into the world of drugs. He decided to maintain his serum 25(OH)D between 60 to 80 ng/ml (this took 15,000 IU of D3 per day in Gus’ case as he is a big guy), take in at least 3 to 4.5 mg per pound of body weight of magnesium as a chelated type each day and lay of the dense carbs. Staying of the carbs was the real issue. I at least convinced him to give up the biscuits and pancakes, but the pasta is another story. Gus loves his pasta. In a few months Gus was elated as his blood sugar had returned to normal without having to take any drugs. His doctor was amazed as well as I discovered that Gus’ sugar had been very high. What can I say, Gus is one happy guy. As more people start to supplement with vitamin D, the cancer rates will fall drastically. This will leave the National Cancer Institute without an explanation. Their position that vitamin D has no significant effect on cancer will confirm that NCI is not an institute of government to promote strategies that reduce cancer, but an institution to maintain the large cancer industry. How can I make this claim – let’s explore. NCI’s lack of understanding is plainly shown in their table of items that they consider to significantly increase the incidence of cancer: Trends at glance from NCI. Of course the things that they consider to be the most significant are tobacco, red meat, fat consumption, obesity, and exposure to the sun. Following the table you also notice that their claims of diagnosis and treatment are significant in their estimation of what is important for survival from cancer and the reduction of incidence. The reduction in all cancer mortality has dropped from 215 per 100,000 in 1991 to 178 in 2007. The drop can be contributed primarily to the reduction in the use of tobacco and the decrease in lung cancer. Further down the page you can see from the graph that most of the reduction has occurred from the reduction in lung cancer death in males. With several studies already in showing a reduction of cancer greater than seventy percent with marginal use of vitamin D3, the reduction of the incidence of cancer will be significant as the population becomes more aware. Not only will cancer be prevented by the use of vitamin D, but treatment of cancer will improve significantly as blood serum for vitamin D is taken to the level of life guards in the summertime. The National Cancer Institute will make all kinds of claims until it has become obvious the blunder that they have made since the early ‘70’s. So can we make a prediction about the rate of incidence of cancer? If the numbers follow the studies about vitamin D and cancer, then as the population gets an average serum level above 40 ng/ml, we can expect the cancer incidence to drop by greater than seventy percent from all causes. Seven out of ten people that you know have cancer would not have had that result. What happens to the medical economy if that occurs? After all, it is not only cancer that vitamin D3 impacts, it is heart disease and diabetes as well, the other two large killers. I am sure this scares the leaders at NCI, HHS, and the medical industry as if they were facing a mountain base-jump with no parachute.